the value of your products or biz opportunity? And if you’re interested in the longer coaching program – please see details below. Buy Your Products and Join Your Team! Re: A Simple Way to Immediately Boost Your Sales and Recruiting Results! If you’re like many of the gals I work with in network marketing/direct sales…I bet you LOVE your products and your business, and are excited about growing your business. The Economy: All the shifts and unpredictability of the last few years has inspired people to look for new ways to make money. Everyone needs a Plan B, but now more people know it! That’s great news for you and your business. Technology: The internet and tools like Facebook and Twitter make it easy to connect with new leads, develop customers and build a team virtually ANYWHERE in the world. Because of this — people who previously weren’t that interested in direct sales are seeing the potential, and getting involved. Women are leaving the corporate world in DROVES to start businesses from home. Recent stats indicate over 400 women a DAY are starting businesses from home, and many of these gals are PERFECT for your opportunity. You and your business are positioned smack dab in the middle of 3 amazing trends, which means you have more opportunity to make big money and a huge difference with your business in the next few years than EVER before! But there’s only one problem. How do you help other people “see what you see” and get excited to buy your products, and join your team? This is perhaps the biggest challenge all women face right now. Think about it! How many people do you know, right now, who definitely need your products…or desperately need another income source…but when you share your business with them, they just don’t “get it”…and you end up frustrated. And if this doesn’t change, how many more sales or recruiting opportunities will you miss out on, just because you can’t get others to see the value in what you have? Here’s something REALLY important I want you to know. If you aren’t making the money you’d like to be in your business…it’s not because of what you are DOING, it’s because of what you are SAYING. And it’s NOT your fault! Most of us have never been taught how to communicate about our businesses, so others can easily SEE THE VALUE in what we’re sharing, then get excited to buy from us our join our team! If you want to book more classes and one-to-one meetings that stick, sell twice the products and recruit business partners that will take you to the top of your company…you need to know how to communicate so people get the value of what you are offering, and take action! And that’s EXACTLY what you’ll be learning through the “Magic Words” program. Welcome to the Magic Words Coaching Program! Get ready to learn the same simple steps many women are already using to boost their bookings, sales and recruiting results 25-60% – in as little as a MONTH! What you are about to learn is truly “life and business-changing”! Discover the important psychology behind selling and sponsoring, so you can elegantly influence people to make decisions and take action. Find out what to say when networking “live” so people are excited to give you their business card…. Know how to talk about your products and business on-line so that people pay attention, and want to find out more about what you do. Feel totally excited to approach people about your business, because what you are doing is working so well, and more people are joining your team. Know how to teach your team to duplicate your results so they are easily boosting their sales 25% or more. By the end of this program – you’ll be able to talk about your business in such a powerful way you’ll easily be recruiting new business partners and selling a lot more products – without having to be pushy or salesy in any way. Why Bother Taking Part in This Program? If you’re like most women in network marketing/direct sales — you already have a FULL plate between building your business, taking care of your family and juggling the many priorities in your life…so you probably need another “to do” on your list like a hole in the head, right? In addition, you’re probably already plugged into other coaching calls, or taking part in your company’s training, so aren’t you already doing enough? Do you really need to sign up for more training?? That’s a very important question, and one worth answering before you decide to take part in the Magic Words program. I recently surveyed many gals who’d gone through these sessions, curious to find out how they saw themselves benefiting by learning the Magic Words approach. In sifting through all the feedback, I realized there were 5 common benefits people were experiencing by taking part in this program. Ever feel nervous or tongue-tied opening up a conversation about your business? Not anymore! Learning this approach makes it more comfortable (and effective) to introduce people to your products, business or both…in a way that helps them see value, without feeling “sold”. When you ask most people to sit down and look at your products/biz…or host a class for you, you likely get a lot of pushback. When you learn the Magic Words approach, you’ll become very skilled at helping people see “what’s in it for them” — and find it’s much easier to book up your schedule with some solid appointments. What if you could sell 25-30% MORE products at all your upcoming meetings, without working any harder? That’s very possible when you learn this approach, because you can shift from “giving a long-winded presentation” to showing people very clearly how your products can help them in many ways. Sales is EASY when you learn how to do this. Most people don’t really “get” what your business can do FOR them, so it’s just easier to say they’re not interested, don’t have time, etc. That all changes when you use the Magic Words approach. You’ll become very skilled at helping your prospects see how your business can give them EXACTLY what they most want — generating more interest, and recruiting many more people into your team. Perhaps the greatest benefit of this program is you won’t just boost your own sales and recruiting results, you’ll also develop the skills to help your team boost their results quickly too. They will LOVE you for helping them make money quickly, and will have more confidence, belief and commitment to stay in activity. 8+ Hours of Video Training. 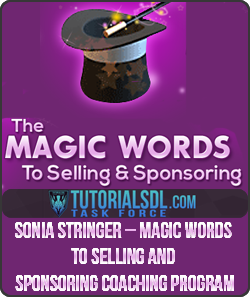 You’ll learn the ENTIRE Magic Words approach, and know how to use this approach to book more appointments — generate more sales at every meeting…recruit new leaders…generate ON-GOING sales from your current customers — inspire your team to fire up and get into activity — use at networking events to attract new business — use on-line (Facebook, etc) to attract new leads — and much more! MP3 Recordings of Every Call — Along with the video training, you’ll also receive audio recordings of every session, so you can download these and take them anywhere (in the car, to the gym, etc). This will be a perfect addition to your “success library” and you can listen to them again and again, on your computer, iPod, or any Mp3 player. Big Fat Workbook — 100 plus pages, chock-full of notes, examples, and “done for you” cheat sheets that do the work for you, so it’s EASY to instantly apply what you’re learning to generate new sales and recruiting results in YOUR business. Live Q & A Coaching Sessions with Sonia: You’ll have the opportunity to connect live and get answers to any specific questions you have, as well as some additional coaching on how to use what you’re learning in your own business.